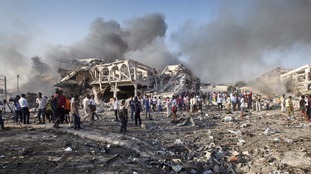 A suspected suicide car bomb has exploded outside a popular hotel in Somalia's capital, killing at least 23 people. 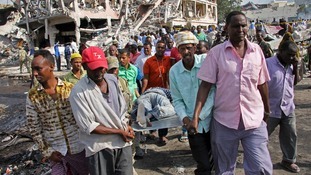 Funerals of more than 300 people killed in a truck bomb blast in Somalia's capital Mogadishu are underway. 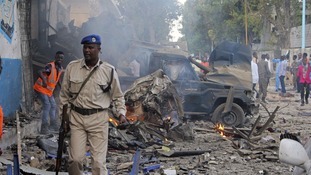 The death toll from the most deadly single attack in the nation's history is expected to rise. The head of the DEC sees how Britons' generosity has helped saved lives, but discovers the situation for millions remains precarious. Up to 50 are thought to have been died after the people smuggler they trusted to carry them to Yemen pushed them overboard to drown. Six years on from the worst famine in Somalia's history, ITV News revisits Minhaj, who was hours from the death the last time we met him. Prime Minister Theresa May is hosting a high-level conference to consider the humanitarian crisis and security situation in Somalia. When Suray Mohamed left her village she was a wife and mother-of-seven - but just weeks later there is only her left. The ship was carrying fuel from Djibouti to Somalia's capital Mogadishu when it was approached by two skiffs on Monday, officials said. When does an urgent food crisis become a famine? An estimated 20 million people - including 1.4 million children - are currently at imminent risk of death.